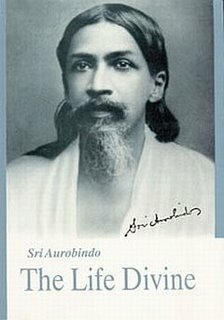 In Chapter V, Sri Aurobindo introduces certain key concepts and uses certain technical terms, which are unique to the build-up of a foundation for a new, futuristic psychology based on the metaphysical foundation of The Life Divine. Sri Aurobindo has already elaborated in Chapter IV the nature of the OMNIPRESENT REALITY behind all manifested phenomena. That ‘Reality’ has been conceived as ‘BEING’ when invested with positive attributes and termed as ‘NON-BEING’ when conceived to have surpassed all cognitive criteria needed for description. The realization of the ancient Indian seers did not stop at Ekam Evadvitiyam. Sri Aurobindo explains that the OMNIPRESENT Reality supports all phenomena that have manifested within the matrix of space and time. It supports all phenomena that are transient, temporal, impermanent; all phenomena that actually represent the multiplicity. After all, the phenomenon of multiplicity is the hallmark of creation. If the Omnipresent Reality behind all manifestation is called the Being, all that has manifested within the field of space and time constitute the ‘BECOMING’. How do we come to the conclusion that despite the multiplicity of the Becoming, the Reality (or Brahman) is ‘ONE’? This oneness is not a statistical concept. It is NOT DERIVED from the summation of all manifested phenomena. It is not also derived from the gestalt concept that the whole is more than the sum of the parts. Now, the Reality or Being (or Brahman) is also experienced as a triune of ‘Existence(SAT),Consciousness(Chit)and Bliss(Ananda)’ – (Satchidananda). Even here, the ONE Reality is NOT A SUMMATION of three experiential terms. Instead, each term of this triune represents a particular poise of Reality. Therefore, when the seers say that Reality is ONE, they mean that the oneness is an oneness in ESSENCE. Heart of hearts, Mind of minds, He alone sits, sublime. Hands that clasp hold and red lips that kiss blow the flute. All He loves, all He moves, all are His, all are He! Many limbs sate His whims, bear His sweet ecstasy. Two in One, Two who know difference rich in sense.